Protopresbyter Georges Vasilievich Florovsky (August 23, 1893 – August 11, 1979) was a prominent 20th century Orthodox Christian priest, theologian, and writer, active in the ecumenical movement. His writing is known for its clear, profound style, covering subjects on nearly every aspect of Church life. Florovsky was born in Odessa as the fourth child of a priest. Inspired by the erudite environment in which he grew up, he learned English, German, French, Latin, Greek, and Hebrew while still a schoolboy. At eighteen, he started to study philosophy and history. After his first graduation, he taught for three years at high schools in Odessa and then made his full graduation including the licensia docendi at all universities in the Russian empire. In 1919, he began to teach at the University of Odessa, but his family was forced to leave Russia in 1920. The young Florovsky realized at that time that there would be no return for him, because Marxism did not accept the history and philosophy he taught. Florovsky thus became part of the great emigration of the Russian intelligentsia, which also included Nikolai Berdyaev, Sergei Bulgakov, Nicholas Lossky, Alexander Schmemann, and John Meyendorff, the latter two of whom later followed Florovsky as Dean of Saint Vladimir's Orthodox Theological Seminary. In the 1920s, he had a close personal and vocational friendship with Berdyaev. The two became somewhat more distanced in later years, largely through Berdyaev not understanding Florovsky's entering Holy Orders, and also through Florovsky's critical attitude towards Berdyaev's philosophy of religion in Ways of Russian Theology. In 1925, Florovsky was appointed professor for patristics at the St. Sergius Orthodox Theological Institute in Paris. In this subject, he found his real vocation. Patristics became for him the benchmark for Orthodox theology and exegesis, as well as a source for many of his contributions and critiques of the ecumenical movement. Despite not having earned an academic degree in theology (apart from several honorary degrees he was awarded later), Florovsky would spend the rest of his life teaching at theological institutions. In 1932, Florovsky was ordained to the priesthood. During the 1930s, he undertook extensive researches in European libraries and wrote his most important works in the area of patristics as well as his magnum opus, Ways of Russian Theology. In this massive work, he questioned the Western influences of scholasticism, pietism, and idealism on Russian theology and called for a re-evaluation of Russian theology in the light of patristic writings. The work was received with either enthusiam or condemnation—there was no neutral attitude to it among Russian emigrés. Among the critics were Bulgakov, the head of the St. Sergius Institute and prominent exponent of the Russian theological tradition of the 19th century, as well as Berdyaev, exponent of the religious renaissance of the 20th century. In 1949, Florovsky moved to New York City to take a position as Dean of St. Vladimir's Seminary. Florovsky's oversight of the development of the theological curriculum led to the Board of Regents of the University of the State of New York granting the Seminary an Absolute Charter in 1953. In 1955 Florovsky was asked by his synod overseers to "lay down the deanship." 1 He thereafter taught at Harvard Divinity School (1956-1964), teaching patristics and Russian religious thought, and later at Princeton (1964-1972), teaching Slavic languages and literatures. He died in 1979. The dates recorded above are the dates of publication in the collected works, not the date of original publications. The series of Florovsky's collected works was published by Nordland Publishing Co., but has been out of print for some years. "Orthodoxy is summoned to witness. Now more than ever the Christian West stands before divergent prospects, a living question addressed also to the Orthodox world… The ‘old polemical theology' has long ago lost its inner connection with any reality. Such theology was an academic discipline, and was always elaborated according to the same western 'textbooks.' A historiosophical exegesis of the western religious tragedy must become the new 'polemical theology.' But this tragedy must be reendured and relived, precisely as one's own, and its potential catharsis must be demonstrated in the fullness of the experience of the Church and patristic tradition. In this newly sought Orthodox synthesis, the centuries-old experience of the Catholic West must be studied and diagnosed by Orthodox theology with greater care and sympathy than has been the case up to now… The Orthodox theologian must also offer his own testimony to this world—a testimony arising from the inner memory of the Church—and resolve the question with his historical findings." 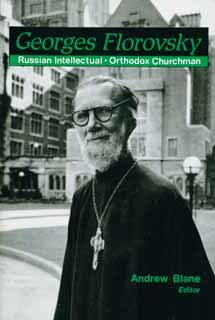 1 Andrew Blane, ed., George Florovsky--Russian Intellectual and Orthodox Churchman (Crestwood, NY: St Vladimir’s Seminary Press, 1993), pp.109ff. This page was last edited on December 2, 2015, at 19:55. This page has been accessed 97,061 times.